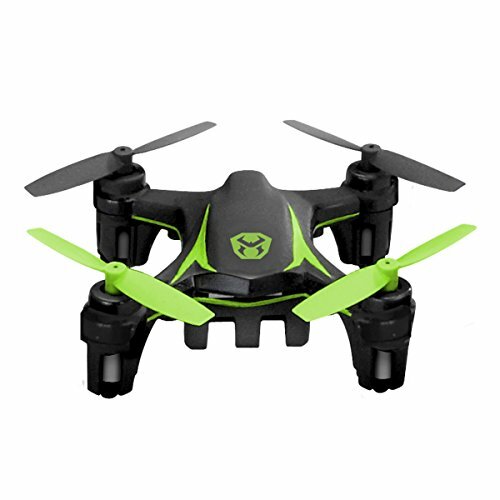 The Sky Viper Nano is quick, durable enough to manage crashes and simple to learn. However, it does have a couple of shortcomings. No protection from falls. Be careful! For drone lovers who are trying to buy a fun, inexpensive and agile drone, the Sky Viper Nano is a perfect choice. It is one of the most popular nano quads out there and it is an excellent choice for everyone who is looking to try out drone for the first time and have some fun. It is available at a very reasonable price, charges pretty fast and is really simple to just pick up and play. The Sky Viper Nano measures less than 3 inches in diameter and it is the smallest in Sky Viper’s four drone lineup. This tiny drone comes with amazing agility and sophisticated technology. Speedy, controllable up to 200 feet, maneuverable, capable of performing stunts at the press of a button, and boasting four propellers to provide even better control, Sky Viper Nano earns praise from users for its performance and quality. The result is a drone that is simple to control, fun to fly and play with. The flight time is usually shorter than you would like. Unfortunately, the battery on this drone cannot be removed, so that means no fast swapping. However, the charging time takes about 15-20 minutes, and then you’ll be able to get it back in the air. You get around 10 minutes of airtime before it begins to get sluggish and eventually hits the ground. Although more on the basic side, this drone is unquestionably fun, albeit simple. As it is a nano drone, the Sky Viper Nano is small enough to fit in the palm of the hand. That makes it ideal for indoor flying, but you can also use it for outdoors flying (as this drone is so light and tiny you should make sure that there’s no wind at all, or you might lose it). There are also two settings for adjusting the sensitivity, which allows for more experienced fliers to take advantage of its manoeuvrability. This means that you can choose between two different speed rates: 50% and 100%. Decreasing the speed to 50% makes the process of learning to fly the drone much simpler. It also gives you more time to react when it comes to flying the nano drone. Once it becomes simple enough, you can switch to 100% speed and continue to develop your skillset. For as tiny as it is, it does have a solid range of 200 feet using a 2 g. GHz radio transmission. The lightweight, but hard frame of the drone makes it fast to manoeuvre and agile. You can safely give Sky Viper to your children. The recommended age by the company is between 1 year and 8 years, so this drone is considered to be safe for young children, as long as they are careful enough. The Sky Viper Nano has two red lights in the back and two green lights in the front that indicate rear/front, so you fly it even easier. Despite its tiny size, however, this drone comes with sophisticated technology that makes it simple to control. For example, the presence of a Stunt button is one of these most fun features. This button allows you to do barrel rolls and other stunts with the press of a button. The Nano’s ability to do tricks effortlessly and fast add to its overall flying experience and make this drone a snap for even beginners to perform fun stunts. The Nano’s ability to do stunts with only one button is one example of an agility that infuses the whole flying experience with Sky Viper Nano drone. In fact, it is the agility that users praise above any other feature of this drone, and is one of the main reasons why the Nano is just plain to fly. The flying experience with this drone is also enhanced by its four-blade technology. This four-blade technology means that the Sky Viper Nano comes with four propellers which have many sensors. These sensors do a variety of tasks – they contribute to the Nano’s general responsiveness and agility when flying, and they also help to sense shifts in the drone to allow it to compensate and stay stable in the air. In fact, users note the drone’s responsiveness and remark that is simple to control, even for inexperienced drone fliers. The only warning that users give regarding to the stability of this drone is a tendency to be blown about outside in windy weather, because of its small size and light weight. So it is safer to fly this drone indoors. Apart from that, users note that the Nano stays manoeuvrable and stable in the air. They also report that the responsiveness and flying experience perform as billed by the manufacturer, making Sky Viper Nano a dependable as well as a fun investment. One other note that users make is that the Nano comes with a transmitter that is set up exactly like the transmitters of more sophisticated and costly drones. The result is that Sky Viper Nano provides a flying experience that mirrors that of more costly drones. The Sky Viper Nano drone is a no-brainer. This tiny and inexpensive drone provides incredible performance. This is one of the best small drones due to its manoeuvrability, ease-of-use, durability, speed, responsiveness, and agility. It is very important to keep this drone away from hair because it has a tendency of getting stuck in the propellers and then you have to take it apart. The Sky Viper Nano drone makes a perfect present for any child (or even adult), it’s tons of fun and will definitely put a smile on your face. What is the difference between Drone vs Quadcopter?